If you like the Percy Jackson and Kane Chronicles crossover featuring testosterone driven lads, then its sequel may be up for you. 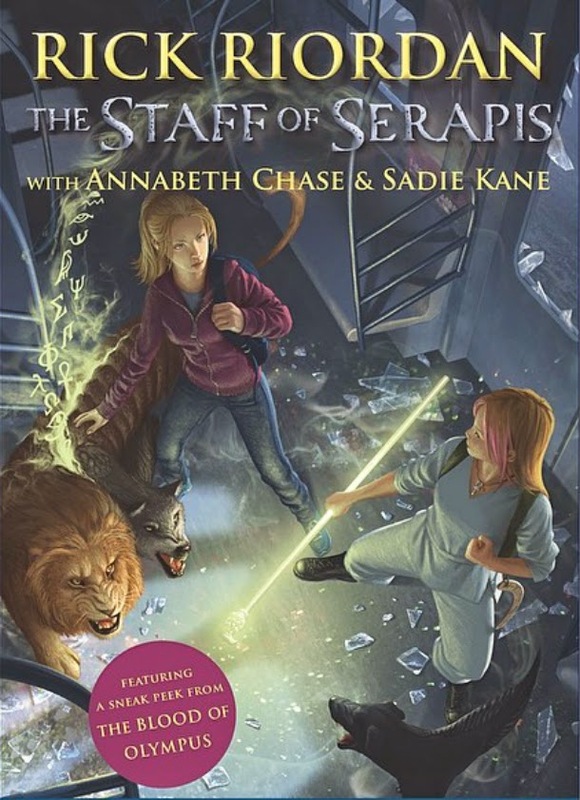 The Staff of Serapis, which follows The Son of Sobek, will this time follow two lady characters we love: Annabeth Chase and Sadie Kane in one story. The story will debut with the release of the North American paperback version of The Mark of Athena, which will be released on April 8th, 2014. The ebook will follow sometime after that, only it will include a sneak peak of the much awaited finale to The Heroes of Olympus called The Blood of Olympus. 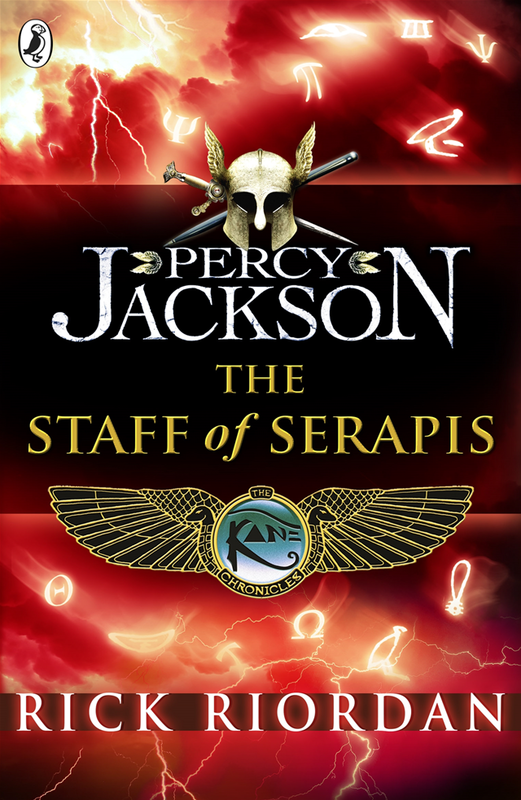 And this coming Friday, April 3, Rick Riordan will reveal the cover of The Staff of Serapis during his live interview at Huffington Post's Tell Me Why. For now let's just stare at the UK edition (above) or the placeholder of the North American cover... but please do come back as I will be reposting the official cover here. Updated: Here is the official cover of The Staff of Serapis by Rick Riordan, finally. I'm sure you'll like this sneak peek of The Staff of Serapis. Here is the video revelation at Huffington Post. This is the story fans have asked for, in which Annabeth Chase teams up with Sadie Kane.The demigod daughter of Athena and the young magician from Brooklyn House take on a larger-than-life foe from the ancient world. Perhaps even more disturbing than the power-hungry god they encounter is the revelation that he is being controlled by someone-someone all too familiar to Sadie. The audio narration was recorded by Rick Riordan himself. As a special bonus, the first chapter of The Blood of Olympus, the final book in The Heroes of Olympus series, is included. The e-book edition of The Staff Of Serapis is expected to come out on May 20th, 2014. The Heroes of Olympus: The Blood of Olympus will be released on October 7, 2014. It's cover hasn't been revealed yet.